Researchers found that habitable alien planets could exist closer to their stars than was previously realized. 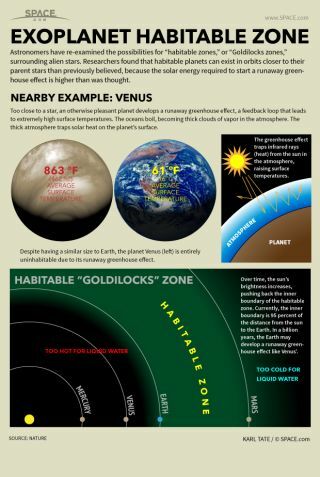 Astronomers have re-examined the possibilities for "habitable zones," or "Goldilocks zones," surrounding alien stars. Researchers found that habitable planets can exist in orbits closer to their parent stars than previously believed, because the solar energy required to start a runaway greenhouse effect is higher than was thought.